MANILA, Philippines – Filipino wrestlers shoot for slots in the London Olympics when they compete in the qualifiers from April 26 to 30 in China. Two-time Southeast Asian Games gold medalists Margarito Angana Jr. and Jason Balabal will lead the PHL team in the qualifiers. 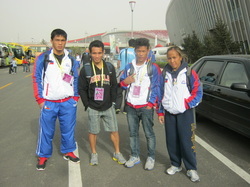 Alvin Lobregrito, a 20-year old freestyle wrestler, and Fil-Am Julie Gonzalez complete the squad. Karlo Sevilla, secretary general of the Wrestling Association of the Philippines (WAP), said the wrestlers will have another shot at Olympic berths in another qualifying tournament in Finland. “If they do not make it in the China qualifiers, then they’ll rush to Finland [and try to win the qualifiers there],” said Sevilla during the SCOOP sa Kamayan forum on Padre Faura Street in Manila this morning. He singled out Angana, an Olympic Solidarity scholar, as having the best chance to make it to Finland because of his scholarship. The Philippines has never had a wrestling bet in the Olympics.